e)	water on Earth is limited and needs to be conserved. 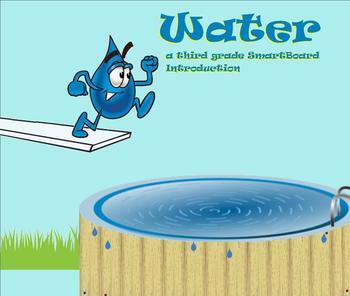 This 3rd grade level lesson focuses on water. 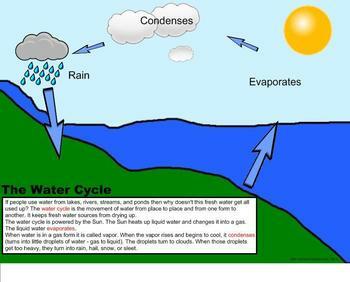 Included is information on the amount of water on Earth, the water cycle, evaporation, condensation, aqueducts, dams, reservoirs, groundwater, wells, and conservation. Terminology is included. 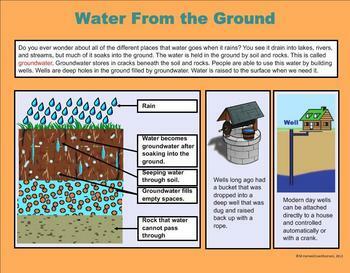 There are also 3 activities (conservation picture, groundwater matching, and water cycle activity). Two of the activities are SmartBoard activities and are also included in a PDF file and modified so they can be printed and issued as desk or homework assignments. The conservation activity is a printable. The activities can also be a lead-up into a writing assignment as well. The white-backed SmartBoard slides are included for adjusted printables.